Dr. Larry McKay is the Department Head and Jones Professor of Hydrogeology. 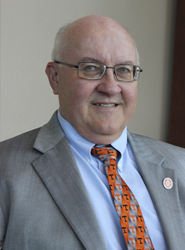 This endowed position was created with a donation from an alumnus, Donald Jones (BS 1959) and his wife Flo, to provide opportunities for UT students in hydrogeology and environmental geology. Dr. McKay received a Bachelor's degree (1981) in Geological Engineering from the University of British Columbia and worked as a consulting engineer from 1981 to 1986. He received his PhD in Earth Sciences in 1992 from the University of Waterloo, Ontario and carried out Post-doctoral research at the Geological Survey of Denmark. Dr. McKay joined the UT faculty in 1993 as an Assistant Professor (and later, Associate and Full Professor). His research interests include: hydrogeology of fractured clay-rich residuum, fractured shale and glacial clay till; fate and transport of a variety of contaminant types, including industrial solvents, coal tar, radionuclides, explosives and pathogens; shale weathering; and paleosols. Dr. McKay was selected as the 2008 GSA Birdsall-Dreiss Distinguished Lecturer and visited approximately 55 universities or research institutions to give research talks. Dr. McKay teaches courses in hydrogeology, field methods, environmental geology and career preparation for both undergrads and graduate students. This includes a PhD level course on Academic Career Preparation, which has helped a number of UT grads find success in tenure-line academic positions. Dr. McKay has served as Head of the Department of Earth and Planetary Sciences since 2009. His work as Head has included strategic planning, alumni fund raising and hiring of 6 new tenure-line faculty members in areas ranging from planetary geomorphology to karst biogeochemistry.